Race and Privilege Stories. That’s I was there for, along with others of Ex Fabula’s inaugural Class of Fellows. This group of ethnically and racially diverse people were committed to sharing personal stories about race and privilege with the community. 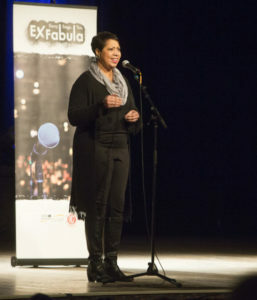 Rochelle onstage at Turner Hall Ballroom, telling her story as part of the December Spectacular in 2015. Photo by Art Montes. I was a blogger, had done television appearances and had even co-produced an annual storytelling event. I’m a black woman who is married to a white guy, and we have a daughter who identifies as both black and white. So, was I walking in with experience in storytelling? Totally. Was I intimately acquainted with race and privilege? Yes. So much so, that Race and Privilege were my frenemies. They knew where each of my buttons was and when exactly to push them. That’s when a funny thing happened. We learned the storytelling process. From brainstorming kernels of ideas that would later blossom into full-blown stories; to the very story structure that is the stuff of which our stories would be made. Truth is, I had never thought of any of that. Guess I didn’t know everything. We learned about listening to each other’s stories. Sure, this listening ultimately developed and refined our stories; but, for me listening was the eye-opener. It’s there in the story of the Asian person who relocated to Milwaukee from Hawaii. It lurks in the shadows of the story told by a white British transplant who still winces at remembering his fellow detainees in customs who happened to be Middle-Eastern continue to be, well…detained even as he was released. It invades my narrow definition of mixed-race when I think on the story a mixed race fellow who everyone assumes is one hundred percent Asian, instead of fifty-percent Polish/fifty-percent Asian. Everyone including and perhaps, especially, me. 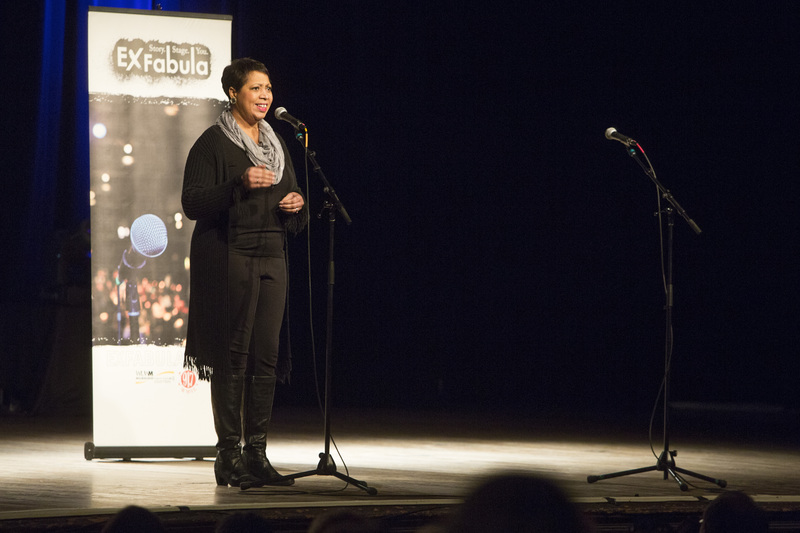 In Ex Fabula’s Fellows, telling your story is only part of the equation. The other – and equally valuable part is listening, hearing, being heard, and being challenged and enlightened because of what you’ve heard. That’s really what storytelling is and does. The question is do you have a story? And are you willing to listen to others’ stories, and experience a moment in their shoes? Are you willing to admit to yourself that maybe…just maybe you don’t know the whole story about Race and Privilege? If like me, your answer is yes, then apply to join this year’s class of Fellows. All it takes bravery, an open mind…and your story. It’ll be the one of the best and life-changing decisions you’ll make. Rochelle was part of the inaugural cohort of Fellows in 2015 and now serves as a storytelling coach for the Ex Fabula Fellowship program. Read more of her writing at her personal blog, www.thelatearrival.blogspot.com. The 2016-2017 Fellowship is supported in part by a $25,000 grant from the Greater Milwaukee Foundation‘s Douglas L.P. Hamilton Fund and Harold Grosskopf Fund; a grant from the Wisconsin Humanities Council with funds from the National Endowment for the Humanities and the State of Wisconsin; and a grant from the Wisconsin Arts Board with funds from the State of Wisconsin and the National Endowment for the Arts. It was an meaningful experience for me too. So glad I applied to the fellowship. This sounds like a wonderful program and I’m glad I just stumbled upon it.